Inspiration meets innovation with Sorcerers of the Magic Kingdom. This immersive, role-playing game features unprecedented interaction with Disney characters who come to life in previously hidden areas throughout Magic Kingdom park. Families, friends and individuals can take on the animated Disney Villains by casting spell cards featuring Rafiki, Rapunzel, Woozles and more than 60 other characters. Individually created by Disney artists and trading card game experts, these beautiful, collectible cards will come in packages of five free to Guests ready to take on the villains. Imagineers spent more than four years creating and perfecting this unique experience, which can be played in 15 to 20 minute segments throughout the Guests’ visit to the Magic Kingdom, or continuously for up to three to four hours. More than 95 minutes of original animation was created for Sorcerers of the Magic Kingdom – equal to a full-length animated film. While trading card games are popular with about 60 million people in the US, this is the first time players can experience the challenge in such a complex environment. Guests of all ages will love the storytelling, the engagement with Disney characters and the discovery of hidden details of the Magic Kingdom. The game can last as long as you want, from 15 minutes to four hours! The 70 cards are divided into nine different spell classes, such as Princess cards, Hero cards or Warrior cards. In addition, all cards are marked with one of three designations – a star symbol, which indicates a rare card; a moon symbol, which signifies an uncommon card; and a planet symbol, which indicates a common card. Lumière’s Candle Blast – This card shows Belle’s favorite candlestick spurred on by his loyal ally, Cogsworth. Mr. Toad’s Wild Ride – This card shows Mr. Toad’s car careening through the underbrush. Prince Naveen’s Army of Frogs – This card shows Tiana’s prince enchanting his amphibian army to action. Rafiki’s Wisdom Stick – This card shows Simba’s counselor ready to imbue some knowledge on the enemy’s forehead. 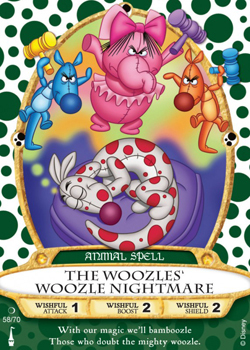 The Woozles’ Woozle Nightmare – This card shows a Woozle dreaming of his most delightful vision: A gang of other Woozles ready to bang some noggins.